Final Fantasy Tactics first arrived in 1998 and introduced a whole new level of role-playing and strategy. After having a spin-off in the Game Boy Advance, Final Fanatsy Tactics came to Nintendo DS as Grimoire of the Rift, a sequel to the Game Boy Advance edition. 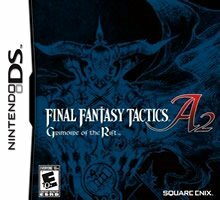 If you have ever played a Final Fantasy Tactics title before, you know it is full of adventure, magic, and tactical battles. In Grimoire of the Rift, this is just what you get. Grimoire of the Rift still has an epic storyline like its predecessors. You are intertwined with destiny that you cannot escape, and you need to venture out in Ivalice, Chronologically set after Final Fantasy XII. A difference in this title is that unlike its predecessors that follow a linear storyline, Grimoire of the Rift requires you to choose the missions yourself making your paths different although there are certain missions you have to complete to progress through the story. The battles are still on a 3D isometric platform and you need to advance towards your enemy, your movement limited to the type of character, abilities, and items. This is the feature that gained Final Fantasy all its fans and made it popular. Countless strategies could be conjured to attain victory, using the units, resources, and items you have. Same as before, there are a number of “jobs” you can set for your units giving them different abilities, giving you more depth in strategy as to which unit to use. But in Grimoire of the Rift, mastering jobs is a little different. You master jobs by equipping job-specific items and winning battles with them. Example, if you want to gain experience as a knight, you equip a knight sword and win a battle with it. Just like before, Final Fantasy Tactics once again delivers a top-quality strategy game. With an epic storyline, customizable characters, and endless possibilities in strategy, Grimoire of the Rift has the recipe of an amazing game.